Want to discover the ugly truth about common vegetable cooking fats and oils, how these bad fats are really produced and why they are harmful for your health, making you sick and triggering weight gain (among other nasty things)? 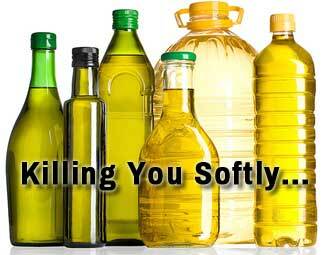 Let’s take a quick look at these before talking about the healthy cooking oils and fats you should consume instead. …canola oil, corn oil, safflower oil, soybean oil, sunflower oil, which are obtained through pressing the plants’ seeds and then refining. But what you probably don’t know is how harmful for your health this industrial process is. For instance, after the initial pressing the mass left is chemically treated (typically with hexane gas) to extract even the last drop of oil from it. This freshly expelled oil still contains many healthy compounds including oil-soluble vitamins, carotene, phytosterols, chlorophyll, lecithin, and other nutrients good for your health. …these beneficial compounds make the oil less stable, thus shortening the products’ shelf life; so these nutrients are chemically removed through refining. various bleaching clays to give these vegetable oils a nice, clear color. And there’s even more agonizing stuff. Bleaching creates a bad odor and taste, so the oils are further de-odorized (at very high temperatures, which burn even the last bit of healthy nutrients). …but a long shelf life, which consumers are told that it is safe to use for everyday frying, baking, and sautéing. If you are like most uninitiated people, that’s what you are using every single day as your regular vegetable cooking oils and fats. That’s what you’re (unknowingly) putting on your family’s table every single day. So before moving on, remember this. If a vegetable oil you see at the grocery store or supermarket does not specifically say on its label “unrefined” or “cold pressed” or “manufactured through an exclusively mechanical process”, you can be sure they’ve been chemically refined and processed through the horrible methods described above. …create weight loss resistance – along with countless other serious health issues for you and your family? Then you may want to find out the highly guarded information on the harmful oxidation that vegetable oils suffer during industrial processing. There’s no better place for this than Fats That Heal, Fats That Kill by Udo Erasmus. Udo Erasmus is the #1 worldwide authority on oils, fats and human health, having a real gift of taking the complex and making it an easy read. His book is possibly the most widely known book on the subject of fats and oils. Just pick up Fats That Heal, Fats That Kill now and take a look – you won’t be able to put this book down. Well, that’s because besides being already spoiled by the time you buy them, most polyunsaturated vegetable oils (canola, corn, safflower, soybean, and sunflower) are too high in omega-6 fatty acids, further aggravating an already out-of-balance ratio of essential fatty acids in the body (i.e., 4-5 times more omega-6s than it should be for optimal health). Are you wondering why are trans fats so bad for your health? Here’s the scoop of it. Trans fats (or hydrogenated fats) are man-made from unsaturated vegetable oils that have been processed through heat and pressure to remain solid at room temperature (for example, all margarines and vegetable shortenings used in baking). Hard-pushed over the last decades, when long shelf-life packaged foods won the convenience debate, artificially hydrogenated cooking fats are found everywhere in all processed and frozen foods like, pizza, pies, soups, cookies, pastries, crackers, chips, all baking mixes and most cereals. Do you like deep-fried foods, French fries, donuts? Well, think twice before ordering them – they are all made with hydrogenated fats.